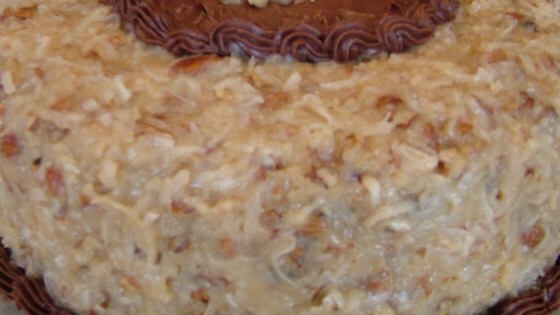 "This frosting is great on many cakes, not the least of which is German Chocolate Cake." In a saucepan over medium heat, combine milk, sugar, egg yolks, butter and vanilla. Cook, stirring frequently, until thickened. Remove from heat and stir in coconut and pecans. This is a really great recipe but I found that it was better when you double the amount of vanilla and add more pecans and coconut. Also it is much better when using real butter. This is a wonderful recipe! I can just eat spoonfuls by itself. It was a big hit with us. You do have to double the recipe if you are going to frost the sides of a 2 layer cake.